BoB likes to make sure my workin's are up to standard! This is how Hadars new steel clay looks out of the container...I thought (as Hadar was good enough to demonstrate mixing) that I'd take some pictures of how it's done. The steel clay is very exciting and I'm very much looking forward to capitalising on it's magnetic properties! Spray the powder and start stirring. 5) Go easier with the water once you get to this stage ~ it's not long after that it really starts binding together. 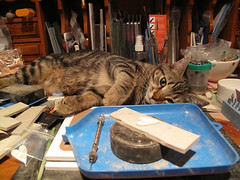 I 've put more pictures in my "Works in Progress" album on my Flickr photo stream. Third fill and fire to go then I can start working on the base! need to be careful with the height now, at 11.8cms tall Anubis (+base) still need to fit in my kiln! This version shows the solder flowed on the base, then the cuff-link finding brought in ~ you'll find an alternative version on my Flickr stream showing the solder being put onto the finding and then brought onto the preheated PMC base. As so many people get the packet and then aren't sure what the "silver clay" should look like here's a short video of what it looks like fresh out of the packet AND how to add moisture to the clay. Above is the Art Clay & Enamel pendant I made after taking Mr Ueedas class at the Guild of Enamellers conference. If you're interested in enamelling it's worth joining the Guild of Enamellers and learning from the immensely talented fellow members. I went to this years conference and would've loved to have done ALL of the many classes on offer. All of this costs the princely sum of just £20.00 amazing! Dorothy Cockrell ~ Cloisonne Mr Ueedas ~ Enamel on Art Clay Silver Jill Leventon ~ Fold Forming & Press Forming Lesley Miller ~ Stencils for Enamelling Janet Notman ~ Torch Firing Copper Beads Many people were trying these things for the first time so the results are fantastic! I'm putting together some pictures on the Art Clay embellishment and enamel class I took with Toshihide Ueeda ~ it was truly a wonderful experience and he and Daisukeb Minagawa (his interpreter) made it a very pleasant learning experience. Can't wait until the next conference! 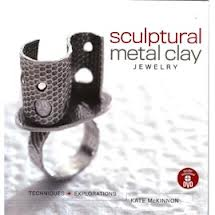 I've had Kate McKinnons "Structural Metal Clay" book for a while now (it's superb) so I was very excited to see the arrival of "Sculptural Metal Clay Jewelry". Kate is a "jewellery engineer" ~ her designs are not only visually appealing, but also constructed for maximum strength and wearability. This book expands on her previous one and also includes a DVD so represents excellent value. Inside the book you'll find a wealth of information broken into three main areas.. Projects: 10 Detailed Sep by Step projects such as: Knobby Chains, Rivet Post Rings, Amphora Pendant and Bird on a Branch Necklace. Favourite Parts: Chain making, easy size shanks and box building sections. Negatives? If you have Kates first book, Structural Metal Clay there is some crossover but as this one is currently £12.99 on Amazon (a saving of £7.00) it still worth buying for the improved layout and fantastic pictures. This book is great for metal clay artisans of all levels. Refreshingly Kate treats metal clay not just as a stand alone product but as one of the many tools and techniques that a metalsmith can employ in their design arsenal.Kates approach is to be applauded and (if more widely adopted) would certainly help metal clays acceptance in the traditional metal smithing community. This month Beads and Beyond magazine have covered my work in a two page "Meet and Greet" feature. It's such an honour to be featured in a major magazine article and I'm so pleased with how the photos and work turned out. Artisan friends of mine assure me I'm not alone in seeing how much more there is to learn (or guilty of forgetting how far I've already travelled). For those of you on the same journey as myself....a few quotes I've found inspiring. "Use what talent you possess ~ the woods would be very silent if no birds sang except those that sang best." Wouldn't this be a great way of replicating PMC masterpieces?? 4) Force the clay into the mould packing it tightly then hammer down the excess on the top. 6) Turn over and push your master 1/2 way in (in this case my round plastic bead). 7) Use the edge of the ruler to make sure the clay meets the edge of the master. 14) Following the instructions on the vids carve a funnel that ends in the hole you poked in the cavity (this is what you pour the metal down so it needs to have plenty of room). 16) Because my bead was round I then did angled holes from the edge to let the air escape.You can see this best on the delft video. 18) Using your pre-prepared crucible, heat up the metal until it's a moving liquid. 19) Keeping the flame on the metal pour the metal into the moulds spout. (There will be Flames!) 20) You can quench the casting in water (rings and all) as the Delft clay doesn't absorb water. NEAT! 21) Once cool gently ease the two halves apart to inspect your handywork. (please ignore the outside holes ~ in the end I did 4 diagonal ones) This part was quite exciting!! 22) Carefully remove the casting and discard any blackened clay (the rest can be reused). Making a 2 part - riveted pendant. Here's my finished Tin & PMC Mixed Media Pendant & below is how I made it. Making a 2 layer Pendant1) First find a lovely tin you like and work roughly how big you need the centre cut out to be. 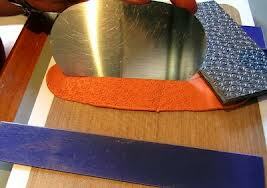 4) Cut out an inner shape using a needle pick or slightly smaller cutter. 5) Let all the pieces dry. 6) Once dry refine the INNER edges of your front piece. 7) Line up the front and back then sand the edges for a perfect fit. 8) Drill pilot holes in the front only to make it easier to drill once fired. 9) Either add a silver clay bail at this point OR allow space to solder one on later. 10) FIRE the clay and allow to cool. 11)Using the fired pieces as a template, cut out the tin that will be sandwiched between the rivets. 12)Check for alignment and trim as needed. 15) Put the wire through the hole and turn pendant over cut wire just under 1mm away from the back of the pendant. 17) Re-insert wire place pendant face down then hit the cut end in a circular motion ~ you're aiming to make a mini mushroom shape. 18) Turn pendant back to front side and if required flatten the end of the ball. 19) Repeat one by one for the other two (or more) holes ~ drilling each in turn until the pendant is fully riveted. I'm so excited & just had to share ~ I've booked to attend the bi-annual PMC Guild Conference at Purdue University, Indianna USA. It's so exciting to be part of this conference and meet PMC artists from all over the world. Days and days of learning and sharing ideas about metal clay! You'll find the conference brochure HERE. Copper pieces all laid out ready for firing. The kiln needs to get to 970 degrees C. I used my enamelling fork to lift the pieces into the hot kiln. The temperature is held for 30 mins & you take them out HOT! Once pickled (which has left my pickle pot in a right mess) the pieces were tumbled in shot for 45mins. Very easy to see the copper in the steel shot (a pleasant change from trying to spot bits of silver). Dried & separated from the shot you can see a few bits of scale which I plan to take off with a burr. The scale seems to stick to straight pieces more than any other shape. The strips were very bendy, dead soft copper (the ones I rolled 4 cards and 6 cards thick). I plan to hammer these to work harden them. 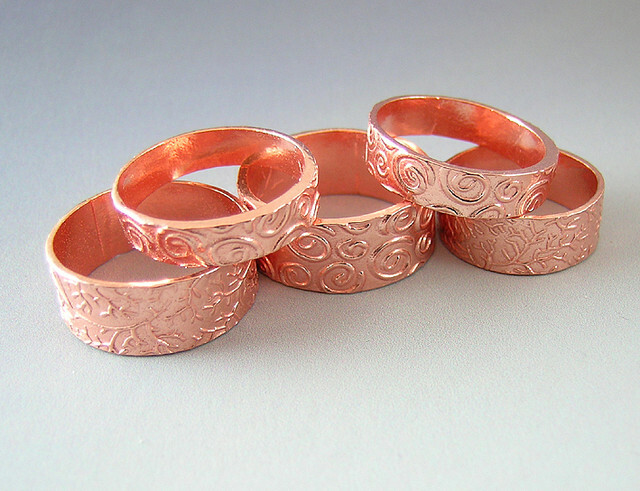 Some of the Finished pieces - Five Art Clay Rings (hmmm maybe I should make some calling birds next!). I've done a little smashing on my ring mandrel but plan to do some more ~ these definitely have possibilities...maybe the centre of some spinner rings? The 12 was done with the Red, 6 card, Rio slats and I prefer the result so would suggest using 6 card minimum. Hope that helps & the end result is Art Clay Copper is well worth giving a try! The clay stuck together well with an angled cut and water join but to be extra sure I gave it a smoosh (technical term there, lol) with the texture plate. This applied extra pressure to seal the join and helped disguise where it was.Hopefully if ACC becomes popular Aida will bring out an Art Clay Copper Syringe type. I shall measure them again after firing. These some of the pieces made from a 50g pack. The pieces used a mix of the blue slats from Rio, 4 cards thick and the red, 6 cards thick slats. Once dry I sanded and baby wiped the edges of the pieces. 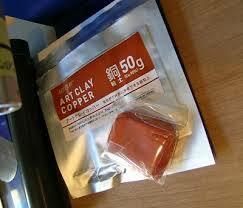 Art Clay Copper sands relatively easily & I found it less "dusty" in comparison to bronze clay. I made sure I wore a mask though as breathing in metal isn't clever! Art Clay Copper - First Experiences! Straight out of the packet it splits at the edge when squished. I decided this meant it needed conditioning. So I flattened it, smeared a little water on and worked it in (much better). Be careful when adding water as it goes into the sticky smooshy stage very quickly. Using the Clay Once ConditionedArt Clay Copper is fabulous to roll and (once conditioned) not at all sticky. It also doesn't seem to dry as fast as silver clay does. I had plenty of time to roll the clay out with not a cracking edge in sight. It also takes texture very well. I used cool slip on the texture mat and wiped off any excess prior to impressing the texture (the Orange on this pic is closer to true colour - did I mention how Orange it is yet? lol). I moistened and worked any clay I wasn't using, wrapped it in cling film and put it in the zip lock bag.